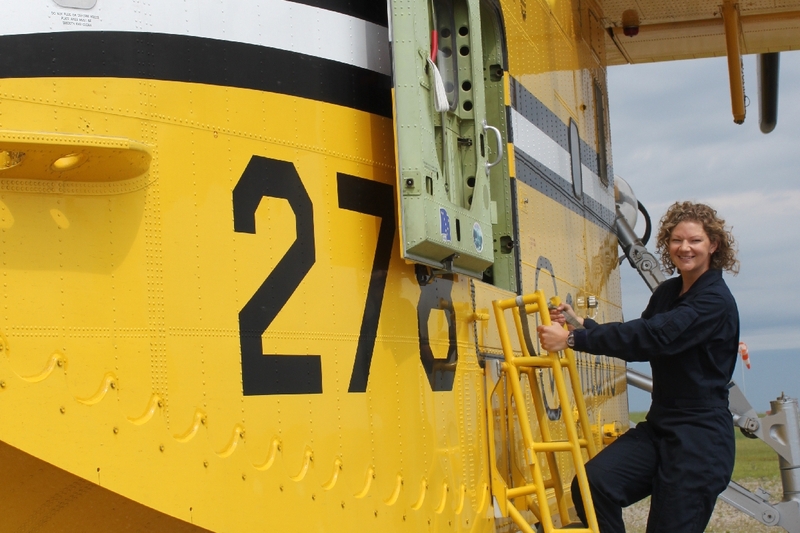 Crombez was the first female to crew the Bombardier CL-415 waterbomber for the Ontario Ministry of Natural Resources and Forestry. She graduated from Confederation College’s Aviation Flight Management program as Class Valedictorian and Female Athlete of the Year. Following graduation, Crombez flew as a bush pilot in North-eastern Ontario, which included three seasons flying the iconic de Havilland Beaver on floats. She was hired by the Ministry of Natural Resources and Forestry as a Twin Otter captain and was selected to take part in unique operations such as aerial rabies vaccinating and polar bear surveys. Currently, Crombez is flying the Boeing 737 for WestJet Airlines. A favourite story on my journey, by Emily Crombez: It was a typical Spring day on red alert in Thunder Bay, Ont. – sitting around, waiting for the fire bell to sound. A friend stopped by for a tour of the mighty CL-415 waterbomber. Everyone is amazed by the three by five inch probes that scoop 1,350 imperial gallons of water in only 12 seconds. Of course, mid-tour is when the bell sounds and we have five minutes to be airborne and enroute to a fire near Stanley, just west of Thunder Bay. My friend happens to live in that direction, so her tour turned into a live action-packed afternoon of watching us bomb a grass and brush fire that was threatening houses in the area. We were scooping water out of Lake Superior – this was the closest water source that wasn’t still frozen in early Spring. Our standard calls after airborne with a load of water are “Tanker 272 up with a load.” As we were scooping and transitioning through the Thunder Bay control zone, we were repeatedly making these calls to tower. After a few radio calls, I mistakenly changed the phraseology to “Tanker 7-up…with a load” and immediately looked left at my captain who was already laughing. Red in the face, knowing I had several friends flying for local operators who heard me, on top of Tower and the fellow tanker working the fire with us, I knew I’d hear about it. I thought the text messages and voicemails post landing poking fun at my 7-up were the end of it, until I showed up to the tanker the next morning, and there was a note “You ordered this from the Tower folks,” along with four cans of seven-up on my seat! It turned out to be an exciting day for my friend, and a few good laughs to keep the tanker base and tower entertained.